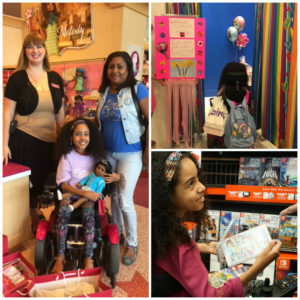 Juliana was granted her wish of a shopping spree at The Florida Mall. All of the stores were amazing! At American Girl she was greeted with a personal shopper and lunch the American Girl Bistro. At Justice she was greeted by personal shoppers and her own dressing room decked out with posters and balloons. She left the first of many stores with a bundle of balloons and more bags than she could carry. The rest of the day was spent shopping for clothes, jewelry, accessories and anything else a 12-year-old girl could want. It was truly a once in a lifetime experience. It is more than just the things that Juliana got that will help her though her journey. It is the memories of the warm receptions she was given at each store, all of the employees treating her like a princess, and the pure joy she felt that day that will have a lasting impact.